On Monday (March 16), Borland announced he was retiring from football after studying the link between football head injuries and degenerative brain disease, and discussing his decision with friends, family members, concussion researchers, and teammates, according to ESPN. The NFL is doing what it can to solve its head trauma issue through an ongoing evaluation and revision of its rules. Rules are changing regarding definition of “vicious hit,” and guidelines are being adopted to protect players, both offensive and defensive. But certainly, one aspect of the game that must change, especially for younger players who haven’t yet learned to protect themselves, is the design of the helmet, which must be better able to absorb an impact from other players or the ground. Several companies are working on designs to mitigate head impacts. University of Michigan researchers have entered the race to build a lightweight, more affordable and more effective football helmet, with a system they’ve called Mitigatium. The design incorporates three different layers that are meant to blunt some dangerous physics that today’s helmet designs ignore. According to the researchers involved in the project, current helmets do a good job of preventing the peak force of an impact that can cause skull fractures, but they still let the brain dissipate the energy created by that hit. The University of Michigan researchers are focused on creating a helmet that absorbs the negative effects of impulse –- the secondary effect of an initial force or hit that may be the cause of brain injury in football players. They explain that impulse is what gives objects momentum and energy. Given the speed and weight of current football players, helmets need to be designed to block or reduce the forces of both impulse and impact. In developing their prototype, the researchers found studies from 70 years ago that blamed impulse for damage caused by the quick, hard hits sustained in football. Yet, the results of those studies don’t seem to have made it into the long-standing designs used today. After testing various materials in table-top collision simulators, the researchers found that the Mitigatium prototype did the best job, with a 20 percent reduction in impulse and a 30 percent reduction in peak pressure. The three layers within the Mitigatium (seen above) include an initial layer of hard polycarbonate similar to what is used in helmet shells today, a second layer consisting of a flexible plastic, and a third layer that is described as having the consistency of dried tar. The first two layers work in tandem to reflect most of the initial force or incoming shock wave, while the third layer dissipates that force to reduce it even further. The overall effect is reduced impact to the brain. There’s no indication as to when a helmet using Mitigatium might be put into production, since more studies and research must be completed. Other universities and companies are engaged in similar projects, including the University of Washington with its Zero1 helmet and Riddell’s Speedflex that was introduced in 2014. Featuring an outer shell that yields upon impact like a car bumper, the Zero1 helmet is expected to be available to select NFL and NCAA football teams this spring and be worn in the 2016-17 season. The Riddell Speedflex is designed with “crumple zones,” which will protect a player’s head upon impact. It is now generally accepted that it’s safer for vehicles to feature impact-absorbing crumple zones. With that in mind, that’s what Riddell’s new SpeedFlex helmet does … Just to be clear, the SpeedFlex doesn’t actually crumple under pressure. It does, however, have a built-in hinged rubber-padded panel located on the front near the top. In head-on collisions with other players (or the ground), this panel gives by up to a quarter of an inch (6 mm), helping to absorb the impact. Many of us have used bicycle-sharing programs in a city or perhaps used a car-sharing co-op, such as Car2Go in Calgary.The Car2Go is a great option for people who don’t own cars but have errands to run or groceries to buy. It’s also a great option for business folks in town for a day who want to see a bit of the city outside downtown. Bikes are also fun for touring, but not everyone wants to pedal when they must get somewhere, especially when dressed up or in bad weather. And car-sharing co-ops require a driver’s license. But there is a new form of transportation on the horizon, the Veemo Velomobile. The Vancouver-based startup is developing a point-to-point service that will allow users to rent a sort of e-bike/car hybrid, the Veemo™. Pedalled vehicles, known as velocars, were a popular mode of urban transportation in France during the 1930s and 1940s. These machines were breaking cycling speed records before being declared ineligible to race by cycling’s governing body. Inspired by this concept, VeloMetro is building Veemo to meet the demands of 21st century urban residents. According to Veemo co-founder Kody Baker, studies have shown that more than half the population of many major cities would like to bike to work, but people don’t want to have to wear biking gear or helmets, and don’t want to have to worry about storing their bikes once they arrive. The Veemo is built to address all of those issues, says Baker. The Veemo is a tricycle enclosed in an aerodynamic body that provides protection from the elements. Think electric bike encased in a racing shell. Although users do pedal it, their pedaling power is augmented by a built-in electric motor, taking the trike up to an electronically limited top speed of 20 mph (32 km/h). The vehicles are technically classified as bicycles, not cars, so no license or registration are necessary to drive one, and its slim size allows for it to easily fit in bike lanes and parking areas. If that top end were any higher, the Veemo would be classified as a motor vehicle, and users would require a license. Svelt as it looks, it wouldn’t be for just any user, I think. The target weight of the final client-ready version is 120 kg (265 lb). I suspect that a tricycle would be pretty stable, but I question how tip-averse it would be on a downhill with tight turns. Other features of the vehicle include a composite monocoque body with integrated crumple zones, an aluminum composite sandwich frame, an automatic transmission (including a reverse gear), hydraulic disc brakes, and a full LED lighting system. Plans call for users to pay a flat rate of CAD$0.28 (currently about US$0.20) per minute, payable using an app. The veemos would be parked in motorcycle spots and other drop-off locations for easy retrieval. A though occurs: given its comparably light weight, what would keep a person from lifting one of the vehicles into the back of a pickup truck and taking off with it? These and other issues are being resolved, I would guess, as the fleet preparation is underway. The first Veemo-sharing service for the general public should subsequently be rolled out in Vancouver sometime next year, with other Pacific Northwest cities to follow soon after. And if you want a Veemo of your own, there are plans for individual sales to commence sometime in the future. I’ve never been a big fan of the Frankenstein or Dracula oeuvre. Truth is, I am greatly disturbed by the manipulation of the natural order. I detested H. G. Wells’s Island of Dr. Moreau. All I can think about is the psychic anguish of the laboratory creatures. So, I am a bit disturbed by the latest research with cockroaches. Sure, they’re cockroaches, but they are independently functioning creatures. I’m not sure about using them as live-specimen robots. I posted yesterday about research being conducted to create cockroach-inspired robots as first-responders after a disaster, or for use in espionage. Today, I write about cockroach robots themselves, actual cockroaches that are being wired for control by humans. Not science fiction. Reality. Years in the making, and a contender for the most revolting creation to emerge from a laboratory, the robo-roach has arrived. Built by engineers in Texas, the robotic insect fuses a live cockroach with a miniature computer that is wired into the animal’s nervous system. At the push of a button, a human operator can control the creature — or at least which way it scuttles. Hong Liang, who led the research at Texas A&M University, said the controllable insect could carry tiny video cameras, microphones, and other sensors to gather information from places where humans would rather not be: collapsed buildings, broken sewers, and politician’s hotel rooms. The US team made tiny backpacks for the cockroaches and attached them to the roaches with paint. Each backpack contained a computer chip that could send signals down a pair of fine wires into nerves that controlled legs on either side of the cockroach. With a rechargeable lithium battery to power the device, the total weight of the backpack was less than 3g, approximately the weight of a U.S. penny. The scientists remotely control the direction in which the cockroach walks by stimulating nerves on either side of its body. When cockroaches walk, the three legs on each side move in time with each other. But the electrical pulses disrupt this, making the middle leg fall out of step with the others. If you pulse the left leg, the legs on the right side work in concert, and the body turns toward the weaker left side. Sort of like paddling a canoe: if the oars on the right side work in concert and the oars on the left are out of step, the canoe will turn toward the left. And vice versa. The system is far from perfect. In tests when robotic roaches were held on little leashes, the insects could be steered about 70 percent of the time. But when the insects were left to roam free, the remote control worked only 60 percent of the time. It might take several jabs of the button to make them turn, even then. Liang is not disheartened though: the robotic cockroach, reported in the Journal of the Royal Society Interface, is still a prototype. Sethu Vijayakumar, director of the Institute of Perception, Action and Behaviour at the University of Edinburgh, has reservations about the work. “As much as the technology is interesting, there are a lot of ethical issues before we go down that line, even with cockroaches. Whenever you interface with another biological system, you have to look at whether the means justifies the ends. It’s something we have to debate,” he said. Even with cockroaches, perhaps we must consider self-determination. There, I actually said it. Imagine a massive earthquake. The ground has buckled mightily, sending buildings and bridges tumbling. Amid the wreckage, human beings await rescue, from humans or dogs. But what if the collapsed structure is too dangerous to risk human or canine life? How are rescuers to identify the location of survivors in time to save their lives? Cockroaches might be repulsive to those who fear germs and creepy-crawly creatures, but there’s no doubt they’re impressive examples of animal evolution. In addition to finding that the critters can carry the equivalent of 900 times their body weight on their backs, the UC Berkeley team also found that, even when squashed down to one-quarter their size, they can still run remarkably fast. To develop their robot CRAM, which stands for “compressible robot with articulated mechanisms,” Jayaram first filmed the roaches using a high-speed camera. Slow-motion viewing showed him that when roaches flatten themselves out to fit through narrow cracks, they can no longer use their feet to propel themselves. Rather, they use the sensory spines on the bottom part of their legs (their tibias) to move forward. This is similar to how, if you were walking on all fours, you’d need to get down on your elbows and use your forearms to pull you through a tight space. The CRAM robot uses this technique and, while it can’t quite flatten out to the degree the roach can, it is capable of being squished down to half its size while still maintaining forward locomotion. The robot was capped with a plastic shield that was capable of being deformed under pressure, which mimics the roach’s exoskeleton, something Jayaram found could smoothly slide past a variety of surfaces, including sandpaper. The researchers believe robots similar to CRAM could one day help in disaster rescue efforts, such as finding survivors in the aftermath of an earthquake. Espionage: A New Kind of ‘Bug’? Meanwhile, Russian scientists from the Kaliningrad-based Immanuel Kant Baltic Federal University have presented a prototype of a 100-percent machine cockroach robot that they have developed for a company whose name hasn’t been disclosed. The university’s website says the company’s requirements for the project were clear: they wanted the robot to look like an existing cockroach, act like one, and be the right size. “Berkeley University has been working on their cockroach for the past four years, but they didn’t have to make it look like an insect, so it’s faster than ours. But it can’t turn at speed and it doesn’t look like a real cockroach at all. Whereas we were specifically told to create a cockroach robot on time and on budget,” the project’s head engineer, Aleksey Belousov, explains. I would guess if it is to be used for spying, such attention to detail would be vital. The robot is about 10cm long, moves with a speed of up to 30cm per second (one-third the speed of a real cockroach), is equipped with light sensors, contact and non-contact probes that allow it to move without bumping into things. So far it can work autonomously for 20 minutes, but the scientists plan to stretch that time. Eventually, the robot will also get its own navigation system to allow users to program its route. Researchers also promise to produce a camo version next week especially for the Russian military, which has already expressed interest in the robot because it can carry a weight of up to 10 grams and could potentially carry portable cameras into enclosed spaces. The possibilities are limitless, especially of such bugs are glued to the inside of paper shopping bags. Ever had roaches get into your house in shopping bags? Neat way to infiltrate, and almost impossible to prevent. We’ve heard the discussions about drones and how they are invading our privacy and adding a new layer of removal in warfare. In the United States, drones are used as toys and spy equipment and as sports observation platforms. They are also being eyed for delivery of must-have items from Amazon. But in Rwanda, and elsewhere around the world, drones could be life-saving equipment. In Africa, drones are being used to help conservation efforts of protected species, such as elephants and rhinos. Human conservators cannot cover nearly the distance in time that a drone can cover, so this makes perfect sense. Now, drones may be used to help humans on the continent, as well. Drones will now be used to deliver medical supplies to the hard-to-reach rural areas of Rwanda and elsewhere. Cargo drones are useful wherever there is a lack of roads. Additionally, they are perhaps less likely to be waylaid or hijacked than are motocycles or vans delivering the same supplies in areas not well guarded by the police or militia. Paved roads and other infrastructure aren’t always available in rural areas of Africa, making it very difficult to quickly deliver medical supplies to those who need them most. Operating our of droneports, delivery drones would fly out from the hub and travel up to 100 km (62 miles) to take medical and other urgent supplies to where they’re needed. The Droneport will offer the remote aircraft a safe place to take off and land, and serve as a manufacturing center for the drones themselves. It will also include a health clinic, digital fabrication shop, post and courier room, and an e-commerce trading hub. All of which are intended to help generate local employment. In Rwanda, there will be two drone networks operating. The Red line will operate with smaller drones for medical and emergency supplies, while a commercial Blue line would transport larger payloads like spare parts, electronics, and e-commerce. The latest initiative sees the Rwandan government enlisting the services of an American robotics company called Zipline, with the aim of carrying blood and urgent medical supplies to rural areas. It will start with the construction of three drone ports in Muhanga District, with a pilot phase slated to have begun in 2016. All being well, Foster + Partners will then construct three Droneports by 2020. The firm reckons that up to 44 percent of Rwanda would be covered by the delivery network. More distant plans include the possibility of creating over 40 Droneports across the country in the future, and expanding into neighboring Congo. Through energy harvesting tiles, backpacks, and insoles, there has been much talk about harnessing kinetic energy to power mobile devices and other electronics. A team of researchers is claiming to have made a big breakthrough in the collective effort to turn human motion into usable energy, developing a new method of producing useful amounts of electricity from our footsteps. The biggest obstacle has been how to harvest the kinetic energy produced by our footfalls. But the researchers at UW-Madison think they have found an answer: reverse electrowetting, a new technology involving a conductive liquid that interacts with a nanofilm-coated surface to produce electrical energy. The difficulty with this technology is that it requires an energy source with a reasonably high frequency, higher than that produced by human motion. To address this problem, the researchers combined reverse electrowetting with a novel device called a bubbler in an effort to bridge the gap. The bubbler contains no moving mechanical parts, but is made up of two flat plates with a conductive liquid in between. In the bottom plate, tiny holes allow pressurized gas to enter, which in turn forms bubbles. These grow in size until they make contact with the top plate and burst. The rapid, ongoing production and bursting of bubbles washes the conductive fluid back and forth to generate an electrical charge. They claim that theoretical estimates indicate up to 10 kW might be possible. The shoes could be used to power mobile devices through a charging cable, be adapted for the military, or act as a power source for people in remote areas and developing countries. Krupenkin and J. Ashley Taylor, a senior scientist in UW–Madison’s Mechanical Engineering Department, have created a startup company called InStep NanoPower, and are seeking industry partners to commercialize the technology. They have already teamed with Vibram in develop a demonstrator shoe with the energy-harvesting technology embedded in the sole. 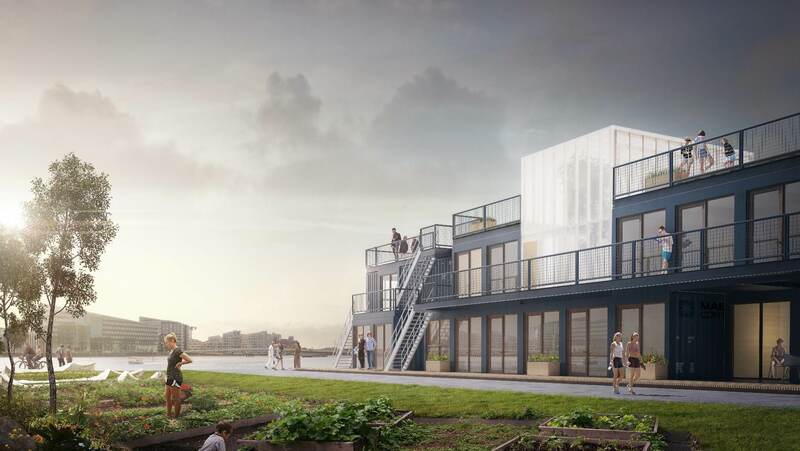 This option of using shipping containers for housing made me think of the 2016 Olympics in Rio de Janeiro, where housing of athletes will be tight, and hotel rooms for visitors to the Olympics will be almost impossible to find or afford. Many folks are turning to renting private rooms and apartments for the Games. Originally, the plan was to build a Y-shaped pier in Rio’s harbor, adding thousands of feet to the existing piers, where six cruise ships could dock for the duration of the Games, thus providing thousands of rooms in a space-challenged city that has an inadequate number of hotels to house the numbers expected for the Games. Long story short, the money for that project “disappeared” in the build-up to the World Cup, and now Rio has a shortage of rooms for the Olympics. 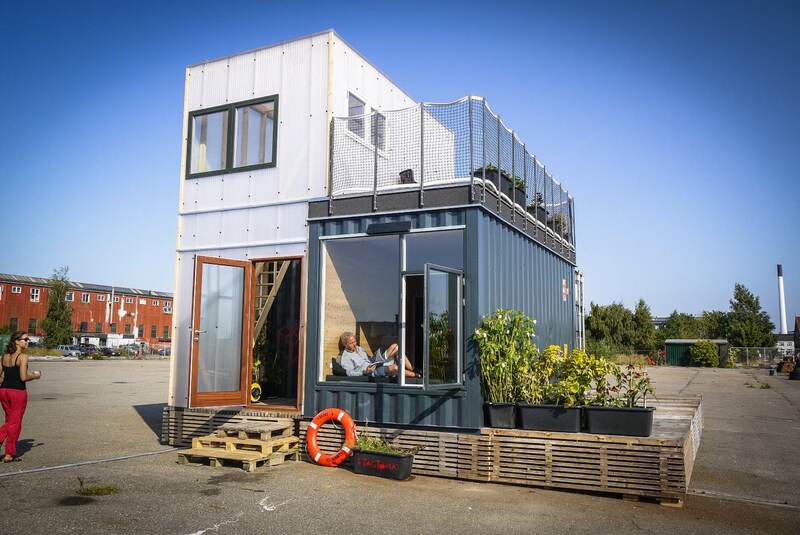 How great would it have been to use shipping containers as temporary housing for the Games, as is planned in Copenhagen for their student housing? 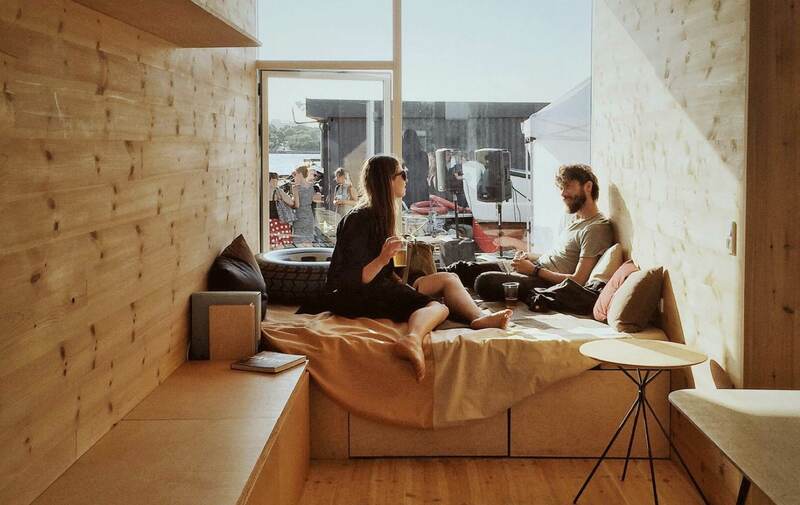 Copenhagen’s CPH Containers aims to create low-cost, container-based student homes for installation on underdeveloped land. CPH will begin construction on a “student village” later this year. This is not a new idea. Such villages have been built in South Africa, London, the US, and elsewhere, and have proven supremely useful, and surprisingly stylish. 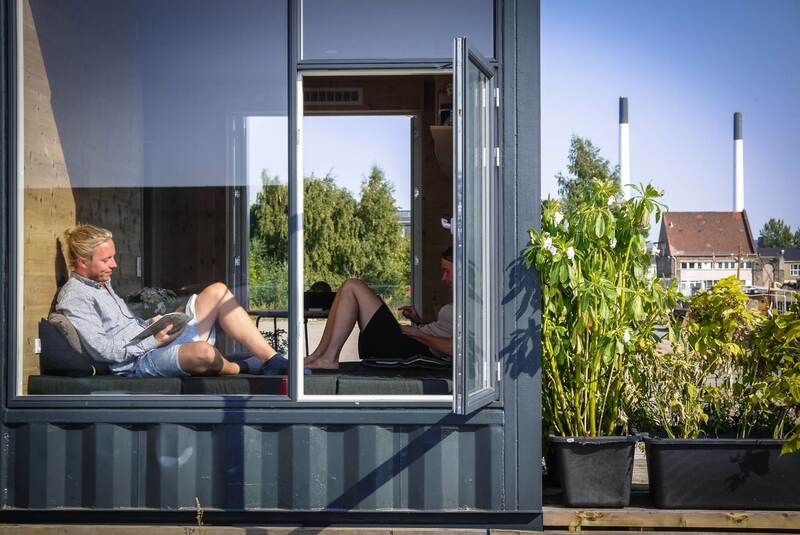 The prototype container home, dubbed CPH Shelter, is made from a 40-ft (12-m) recycled shipping container, and features an additional two-floor polycarbonate structure. 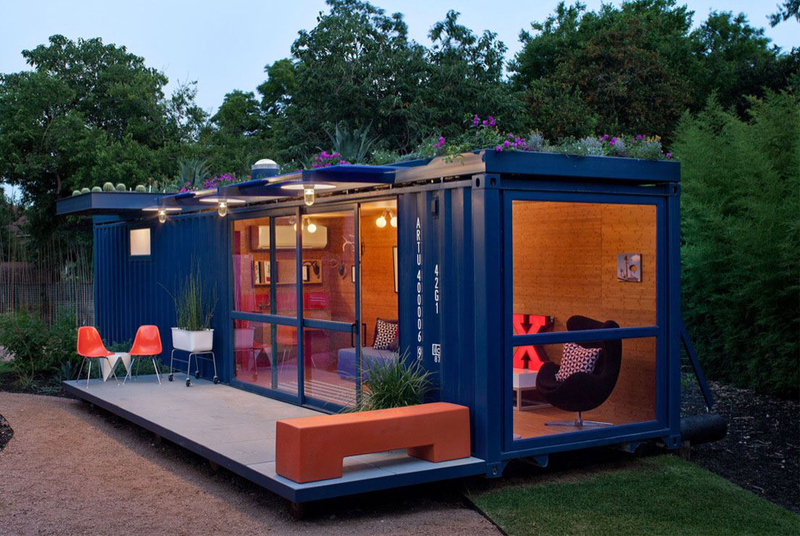 The container home’s interior comprises a lounge/dining area, kitchen, bedroom with daybed, and a bathroom with shower and toilet. 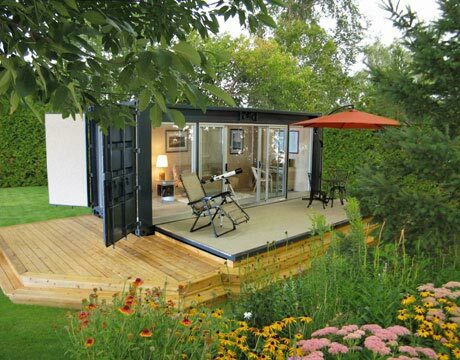 These homes offer tempting benefits: container structures are easy to construct and are easy to dismantle and move, with no significant foundations required. There’s also the environmental benefit of building with recycled materials to consider. However, the positives must be weighed against a container’s lack of insulation and the difficulty of keeping it cool in summer and warm in winter. To address this, CPH Containers has installed wood fiber and paper-wool insulation, in addition to an automated mechanical ventilation system in the bathroom and kitchen. The firm also says that its polycarbonate winter garden offers warmth on a sunny day (though an efficient heat pump is also installed). 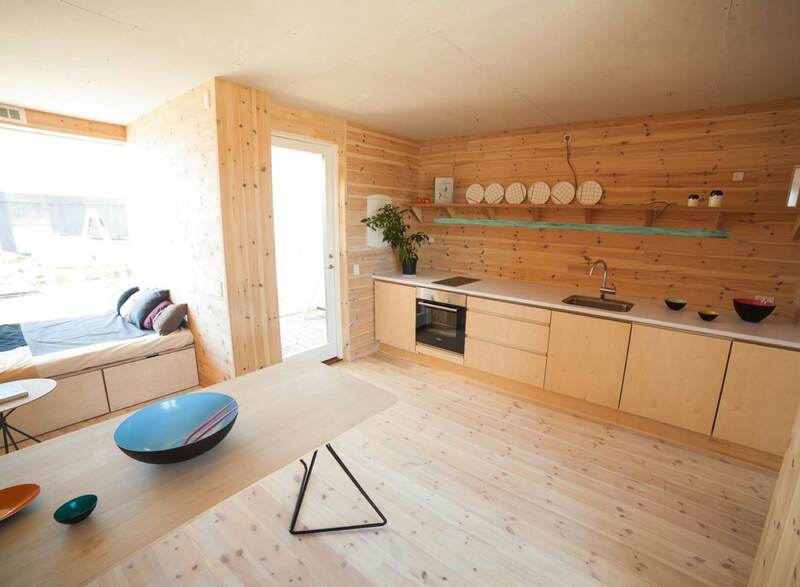 Given the popularity of tiny houses these days, I suspect that land-strapped cities around the world might give these pre-fab homes another look. Certainly, they could be a useful idea for any city hosting the Olympics or other major event that draws millions to a city temporarily.